Horseback Trail Riding and Lodging at its best! Horseback riding in New Mexico is a must-do! 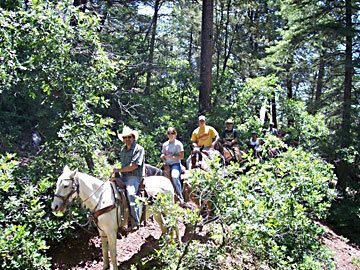 Elevate your trail ride by going horseback riding in the picturesque Cibola National Forest! As the only ranch with a permit to ride in the park, you can discover the Cibola National Forest on a one to four hour horseback ride with a real cowboy & native New Mexican as your guide! Whether you are an experienced rider or a beginner, we will ensure your ride is fantastic. If you'd like to stay with us for awhile, we offer our Country Cottage as a vacation rental. 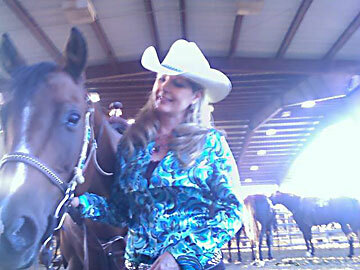 (505)281-5197 or drop us an email at info@cedarcreststables.com. 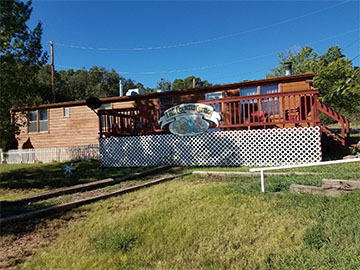 Cedar Crest Country Cottage and Stables is located just minutes from Albuquerque on the Turquoise Trail National Scenic Byway. From Albuquerque, New Mexico take Interstate 40 East to the Tijeras exit (Exit 175). Head north on NM 14 (Turquoise Trail National Scenic Byway) to mile marker 4, just past it. Take a left on Snowline Road (gravel) Go west 1/2 mile, keep left, 1st driveway on left, The Romeros. Cedar Crest Country Cottage and Stables is located on Snowline road one-half mile off of NM 14. 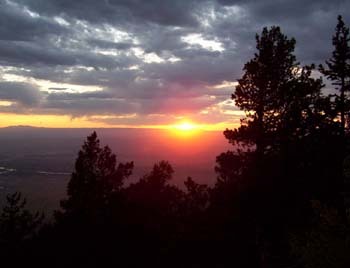 Travel time from Albuquerque, New Mexico is 15 minutes. From Santa Fe, New Mexico at the Cerrillos Road exit of Interstate 25, head south on N14 (Turquoise Trail National Scenic Byway) until you pass mile marker 5. Take a right on Snowline road (gravel) Go west 1/2 mile, keep left, 1st driveway on left, The Romeros. 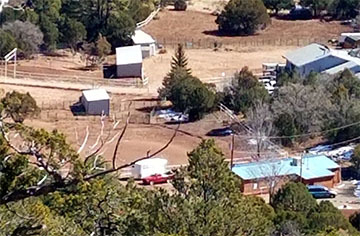 Cedar Crest Country Cottage and Stables is one-half mile off of NM 14. Travel time from Santa Fe, New Mexico is approximately 45 minutes.